HDMI Ethernet Channel technology consolidates video, audio, and data streams into a single HDMI cable, combining the unmatched signal quality and convenience of HDMI connectivity with the power and flexibility of home entertainment networking. It incorporates a dedicated data channel into the HDMI link, enabling high-speed, bi-directional networking at up to 100 Mb/sec. With networking capabilities now available in a wide range of IP-enabled home entertainment devices, from TVs and gaming consoles to DVRs and more, adding an Ethernet channel is a big step forward in the evolution of the HDMI standard. 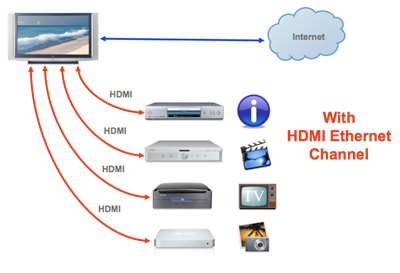 Consumers can enjoy all the benefits of Ethernet connectivity via HDMI, and further simplify their systems by eliminating the need for separate Ethernet cables. Provides a true one-cable solution for all your home entertainment needs, offering HDMI’s world-class quality and reliability plus all the benefits of home entertainment networking in one powerful connection. Look for devices that include HDMI Ethernet Channel functionality. 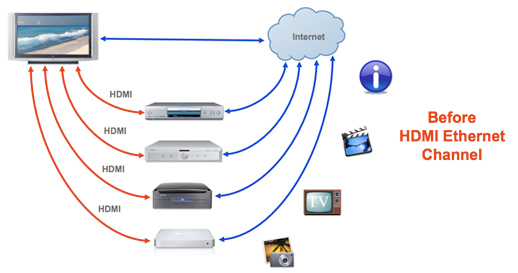 Connect your devices through HDMI Ethernet Channel-enabled HDMI ports. HDMI Licensing has strongly recommended that Adopters label all HDMI Ethernet Channel-enabled HDMI ports with the letters "HEC" for easy identification, but does not require manufacturers to do so. Please check with your manufacturer to determine which HDMI ports (if any) will support HDMI Ethernet Channel functionality.